It's bad enough when leftists smear capitalism. I hate it more when capitalists do it, too. I'd hoped for more from the world's current richest man, Jeff Bezos. I love the service he created. Amazon lets me buy Christmas gifts right from my couch. Its prices are so low that the Fed chairman says Amazon probably lowered America's inflation rate. Entrepreneur Jeff Bezos is a hero. He created lots of jobs and better service, and he and his investors pay billions in taxes. So I got angry when I saw Sen. Bernie Sanders' opportunistic fundraising letters condemning Bezos because some of his workers are eligible for food stamps. "In ten seconds," whined Sanders, Bezos makes "more money than the median employee of Amazon makes in an entire year." Well, at least Bezos will stand up for himself and the free market system that created his wealth, right? At first, he did. Amazon called the criticisms "inaccurate" and "misleading." It's not the company's fault that some workers qualify for handouts. More people would collect them if Amazon did not hire. By creating jobs, Bezos gives workers better choices. But the anti-capitalist media don't report that. They called Amazon a "sweatshop" and "cutthroat corporate jungle." So Amazon, to my disappointment, caved. The company announced it would pay all its workers at least $15 per hour. MSNBC anchors grinned with glee. Of course, the higher wage will be good for workers who still have jobs. But what progressives don't understand is that entry-level workers will be shut out. Poor people's lives are made worse when laws meant to protect them price them out of jobs. Those unhired workers are just as real, even if they're harder to see. My recent video on this features a restaurant manager who understands that she only got the opportunity to work because when she was a teenager, her boss could pay her much less. Had a higher minimum wage existed then, her labor would not have been worth it to the restaurant, and she would never have gotten a chance to work her way up the ladder. "Minimum wage jobs are an entry-level job to get someone some experience," says California restaurant manager Merv Crist. "Raise that high enough, you cut people out of the market completely!" That's not compassionate. Yet progressives talk as if a higher minimum wage lifts everyone. At least Amazon is just one company, and Bezos just one CEO. If he wants to pay his workers more, fine. Amazon will attract better job applicants. Beginners, kids, the disabled, etc. will still have other choices. They can get jobs elsewhere. Bezos was still a man to like. But then Amazon announced that it would lobby government to force everyone to pay what Amazon pays! This entrepreneur I admired turns out to be just another craven opportunist. Bezos knows a higher minimum wage will hurt his competitors more than it hurts him. Amazon has a lead in automation. He's already replacing some workers with robots. 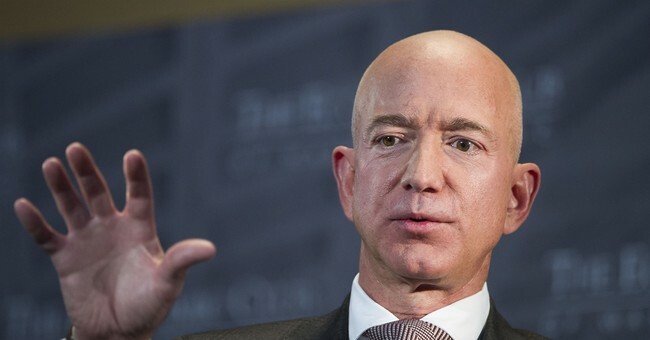 I suppose Bezos is just being clever: He'll use government to handcuff his rivals -- and then pat himself on the back and pander to progressives who believe a higher minimum wage spreads money with no ill effects. If American politicians are dumb enough to think they can raise wages by force, maybe a CEO has a fiduciary responsibility to his investors to pander to those politicians. Bezos has done this before. Amazon didn't just announce it would build a second headquarters. It started a competition to see which politicians would squeeze their taxpayers most. One city council even voted to grab land to create a new town called Amazon, Georgia, if the company moved there. That city should be grateful it wasn't chosen. Now taxpayers in New York City and Arlington County, Virginia, will subsidize Amazon's jobs. This is not good for taxpayers or capitalism. Politicians shouldn't pander to companies, and companies shouldn't pander to politicians. We need separation of shopping and state. Bezos should stick to innovating, not scheming with politicians. Sometimes the worst enemies of capitalism are capitalists. Being a store front for Chinese goods made with stolen technology and using taxpayer subsidized labor to process orders is not capitalism. It adds no value to the over all wealth of the USA. The wealth is created in the factory. But this is only important to the patriot/nationalist and of no concern to the globalist. I see very few actual capitalists out there anymore. Only opportunists who glom onto government in hopes that it can be bribed into tilting the playing field in their direction. My local “business news” rag is filled with nothing but supposed entrepreneurs and CEO’s whining that government isn’t doing enough for them. They are undermining the argument to low-info voters as to why they should not vote Socialist. Government is tilting the playing field anyway, so it all becomes a scrum where everyone tries to tilt it in their own direction. Bezos is a corporatist, masquerading as a capitalist. None of the high-tech Lords of the Universe are capitalists. Chick-fil-a and Home Depot are capitalists. Trump is a capitalist. Globalists aren’t ‘capitalists’. They push for crony Communism. All animals are equal some are more equal than others. No revolutionary leader wants to live in a hut with the common labourers. Mom-and-pop stores could not absorb the increased labor costs, but places like Wal-Mart, Amazon, and Home Dept can. Not only will they not fire anyone, they’ll keep hiring as they open new stores. The economies-of-scale that these large firms benefit from offsets the increased labor costs. Unless they are simply making other poor, business model decisions they are gonna easily be in the black. One problem is that when capitalists run into the modern media and its Alinsky tactics, they immediately become fascists. Kill the media. The world will become instantly better.